In response to the global sustainability agenda, a two-day long Impact Conclave, 2016 was held at The Lalit, New Delhi. 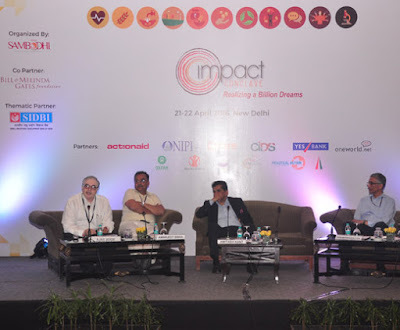 Attended by around 400 professionals, such as, policy advocates, top bureaucrats, Civil Society Organizations, and academicians, the Conclave aimed to fix the spotlight on the complete life-cycle of impact creation. two days. Hosted by Sambodhi Research and Communication Pvt. Ltd, this event was supported by BMGF, SIDBI, ACTION AID, NIPI, Care India, CIDS, Yes bank, Oneworld.net, Oxfam, Save the Children, WASH initiative, Practical Action and the National Foundation of India.